Software Freedom Day (SFD) is a global, grassroots effort to educate the public about the availability and benefits of Free and Open Source Software (FOSS). Local teams around the world organise events on the third Saturday in September. In 2007, Software Freedom Day was celebrated on September 15th. This article is a report on the planning that went into SFD 2007, a overview of the presentations made on the actual day and various photos and video clips from SFD 2007. 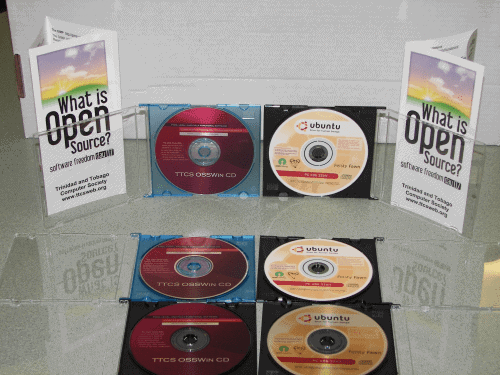 We received materials and CDs from the Software Freedom Day organisation during the last week of August. During that week, the venue for the event was confirmed as Hand Arnold (Trinidad) Limited, El Socorro Road Extension, El Socorro, San Juan, Trinidad. TTCS has held some of its previous tech meetings at this location. 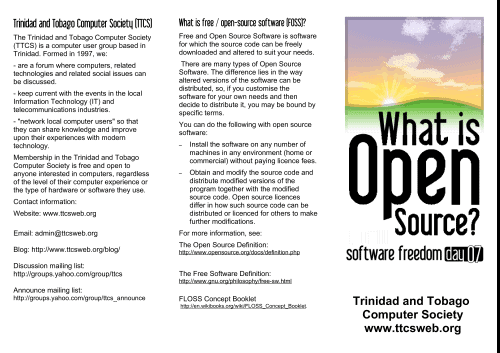 a flyer with information about the TTCS, TTCS OSSWIN CD (our CD compilation of open source software for Windows), Ubuntu and open source to be given to persons on SFD. To minimise costs, it would use a single sheet of paper. a one page flyer to promote SFD – this would be put online for TTCS members to download and distribute to the public. 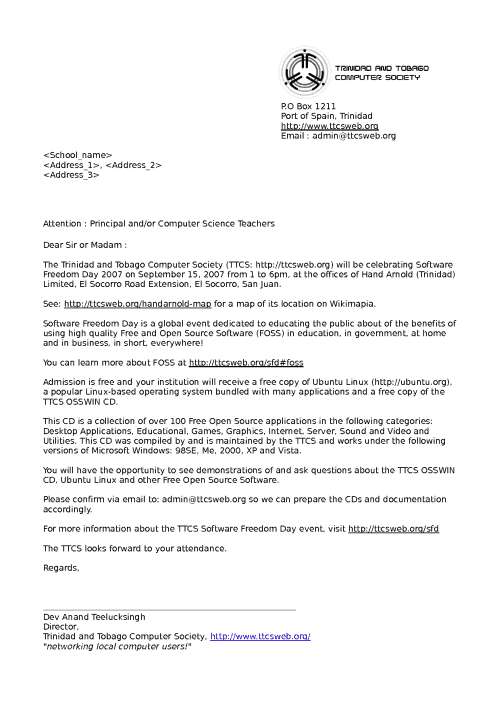 This had to be done before 7th September 2007.
mention if they attend, they would receive an Ubuntu and a TTCS OSSWIN CD free of charge and get to see demonstrations of the software and learn more about opensource. promote SFD via the TTCS Facebook group and other computer related email lists. at least three computers to be available on SFD to demonstrate Ubuntu and open source software for Windows. a meeting on September 8th, 2007 to prepare machines for SFD, to meet with volunteers willing to help with the event. 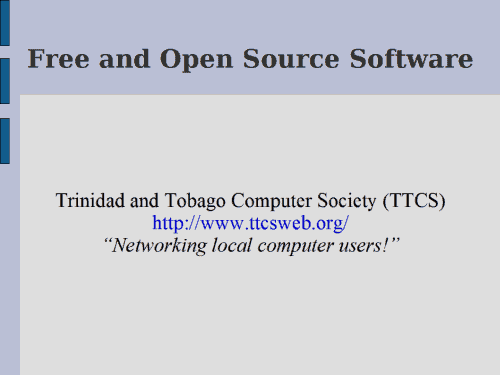 A TTCS FOSS tri-fold brochure (PDF ; 654K) about Free and Open Source Software was done (it is a modified version of a brochure from http://geekosophical.net/misc/sfd/ and also made available online. 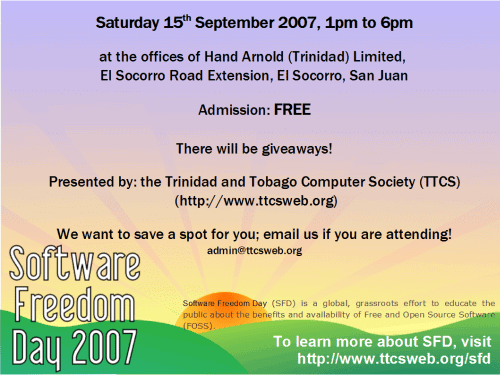 The official TTCS Software Freedom Day webpage at http://www.ttcsweb.org/sfd was completed and the TTCS home page also carried the announcement of the Software Freedom Day event. It was decided that there should be a door prize or giveaway of some sort. The Official Ubuntu Book (2nd Edition) and and OpenOffice.org 2 Guidebook were ordered from Amazon.com so that the books would arrive before SFD. The list of secondary schools was obtained from the Ministry of Education website, the relevant data extracted and put in an OpenOffice.org spreadsheet. There were 200 secondary schools in all. on Ubuntu – show overview of desktop – how menu are organised, how to change appearance of desktop (wallpaper, add programs to menu, etc) doing common tasks with Ubuntu, for example: internet tasks such as chat, browsing, email, voip; media playback of restricted formats; synchronising a music player with Ubuntu; connecting digital cameras and organising photos; how to install a printer; gaming; running Windows apps in Ubuntu. Discussion of CD-Rs needed for TTCS OSSWIN CD and Ubuntu – should we use printed CD-R labels, or use plain CDs with a paper-case label to save costs. The desire of good presentation won out in spite of the increased cost and extra work of printing labels on printable CD-Rs (only two persons have such inkjet printers). preinstalled Ubuntu machine installed with up-to-date software (compiz-beryl, flash, restricted formats). one of the presenters will bring his laptop which already has Ubuntu. a Windows laptop for persons to try out OSS for Windows. The extra machines would allow attendees try out FOSS for themselves during the breaks. delivered to the local post office on Monday September 10th. A meeting was held on Wednesday September 12th, 2007. A more definite agenda of what would be done on SFD was agreed upon and also how to arrange the layout of the venue. During this week, 80 TTCS OSSWIN CD labels were printed and 50 Ubuntu CD labels (using the Ubuntu CD artwork on the Ubuntu’s DIY Marketing page) were printed. The night before SFD, the printed CD-Rs were burned with the appropriate data. About 120 tri-fold brochures were printed. Arrived at the venue at 10am to prepare the venue in time for 1pm. Event started at approximately 1.10 pm with around 27 people present. 1.15pm – An introduction to the TTCS what the TTCS does, highlighting our website at http://www.ttcsweb.org/. 1.35 pm – A Introduction to Free and Open Source Software (PDF ; 103K) presentation was done. 1.59pm – Overview of Software Freedom Day. 2.05pm – 2.18pm – Short break to prep for Ubuntu presentation; refreshments for the audience. 2.20pm to 3.15pm – Introduction to Ubuntu. Demonstration of a “live” CD. Gave overview of the Ubuntu desktop. Began a hard drive install of Ubuntu. Answered questioned from members of the audience while the installation was in progress Gave background to how Ubuntu came about ; what “Ubuntu” means (played the included video clip “What is Ubuntu”), with a brief biography of Ubuntu founder Mark Shuttleworth. 3.15pm to 3.30pm – Break While refreshments were served, many attendees asked several questions and made use of available machines to try Ubuntu. 3.31pm to 4.12pm : Demonstration of installed Ubuntu This machine was pre-installed with Compiz, restricted formats, Adobe Flash player, Nvidia restricted drivers Did an overview of the large number of applications available and how to add/remove applications. How security updates are performed Described how a new version of Ubuntu is available every 6 months. Discussion of proprietary formats (e.g. MP3, WMV) and why Ubuntu does not include support in the default install Described how to add support for proprietary formats. Showed OpenOffice.org and discussed the benefits of non-proprietary formats. Showed Compiz including effects such as the rotating cube and switching between applications. 5:10 – 5:45 pm – more OSS for Windows from the TTCS OSSWIN CD Continued the overview of OSS for Windows from the TTCS OSSWIN CD. 5:45 – 6:00 pm – Book giveaway One member of the audience received The Official Ubuntu Book (2nd Edition) and another received the OpenOffice.org 2 Guidebook. Seven persons directly helped with the running of SFD on that day and three other persons helped with the preparations leading up to SFD. Forty one persons signed the attendance sheets, many were secondary school representatives who responded via email before SFD. A few were from the IT department of T&TEC (the local electricity company) who found out about the SFD event when a TTCS member who worked there, printed and showed the flyer to them. Mark Lyndersay who writes BitDepth, (a weekly column about personal technology published in the Trinidad Guardian newspaper) was present at SFD 2007. 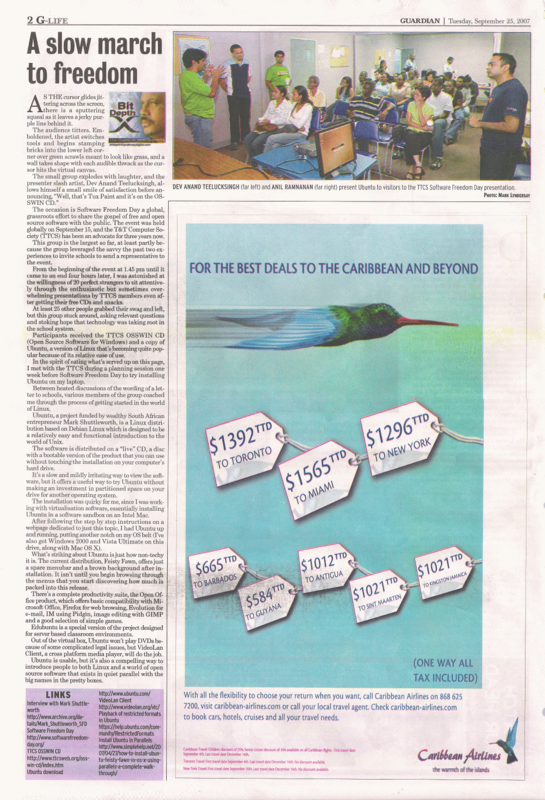 He wrote about the TTCS SFD 2007 event in BitDepth #595 – ‘A slow march to freedom’, which was published on Tuesday September 25th, 2007 in the Trinidad Guardian.